This Sunday is going to be the BEST DAY EVER! Because a new Target store - you know the Red Dot Boutique - is opening up less than a mile from my house. Here's an old satellite picture of the location. 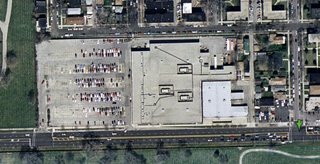 There used to be an old K-Mart here, as you can see the K-Mart was on the east side of the lot and the rest of it was parking lot. Well, the new Red Dot Boutique is taking up this ENTIRE space. They built the new store so that it was as big as the lot, with parking on the first level and the store on the second level. It's supposed to be one of their new "concept" stores, so we're all in a twitter (well, I'm all a twitter)! A mile away.......I told The Boyfriend that we were going up there at 8:00...he told me that I could go by myself and then come back and get him. I figure, in your lifetime, how many Target Grand Openings can you go to? Not many I think. Some more quality has arrive to you around the corner. Enjoy the grand opening. I loved to go shopping in those huges centers, when I used to live in Los Angeles, long, long ago(I was 15 years old). My problem is, that I'm always to lazy to read what I have written, but I am not consequent, because afterwards I feel ashamed. Have fun and let us know how it was. I kinda miss shopping in big centers. Toño - Thanks for stopping by and leaving a comment, there's no need to be shy around here. CS - Target is probably my favorite store! Oooooh, I love Taret. And I miss Target.